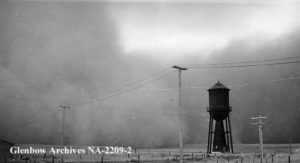 In 1904, Charles W. Carman of Chicago, a civil engineer, purchased 1500 acres alongside the Little Bow River and started one of Alberta’s largest wheat farms, the Carmangay Farm Company. A town began to develop. The town was named after C.W. Carman and his wife, Gertrude Gay. Their son’s name was Gay Carman, thus the name Carmangay. The location of the town was decided by the Canadian Pacific Railway. CPR looked for a spot to build a bridge across the Little Bow. The present spot was decided upon, as the valley was narrower here than for many miles up or down the river. Until the bridge was built, the train would travel to the edge of the valley, stop and unload the mail, wagon the mail to the waiting train on the other side and continue its journey. 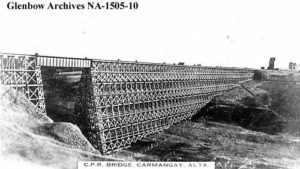 The trestle bridge was completed, made of wood, in 1911. The present, steel structure was started in 1928. The work was done, so as to not disrupt train traffic. The spans on top and between the towers were place on Sundays, when the line was free for 20 hours (more or less). Weekend by weekend, the wood trestle was replaced with steel. One of the first buildings in the Village was the Grange Hotel. Built in 1909, and opened in November of that year, it stood out on the empty prairie. 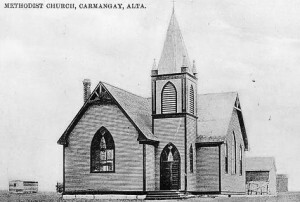 The landscape quickly changed, as the church and fire hall were built in 1910. The Carmangay Stampede once rivaled that of the Calgary. 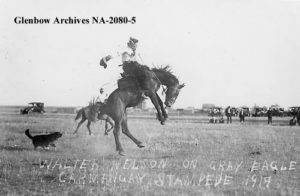 Starting in 1908, the town of Carmangay sponsored cowboys to have a bucking contest. It was held on the south side of the Little Bow, about 300 yards east of Highway 23. In 1909, a contest was held on the main street of the new town. 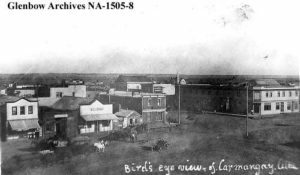 And in 1911, the Carmangay Agricultural Society was organised and started the Fair, which included sports programs, including bucking contests. A chute was built in 1917 and the number of participants went up. After World War I, the fair was not held and during the early 1920’s, the stampede was restricted in allowed time and prize money. Eventually, the Stampede was discontinued. Attendance at the Fair waned, as people wanted the Stampede back and so in 1926, it was revived. It grew with the construction of an arena, complete with 4 chutes, and corrals at both ends. It included thoroughbred racing, professional and amateur riding, chariot races, bootlegger and potato races and other novelty races, a midway with rides for the children, baseball games and other events. 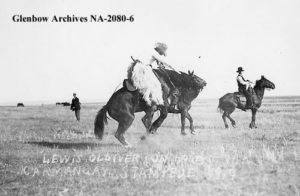 The Carmangay Stampede became known as the “Biggest Little Show between the Big Bow and Oldman Rivers”. People came from miles around, and attendance sometimes exceeded four thousand people. 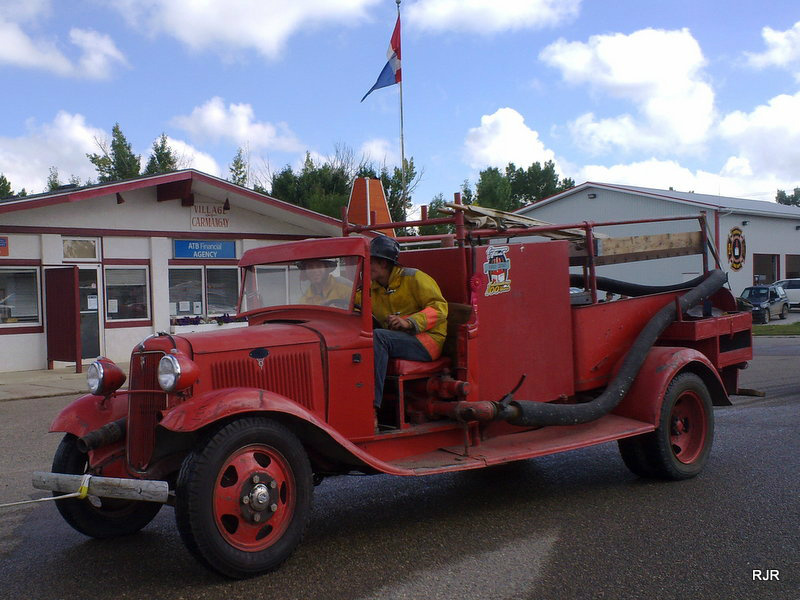 Sadly, the summer of 1947 was the last Stampede in Carmangay. No reason is given for discontinuing the event. 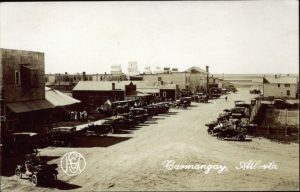 Carmangay was incorporated as a town in 1911, but reverted to village status in 1936.